Draw the Diagram. Each category finds its place on the x-Axis. Centering of the process data: The centering of the data provides information on the process about some mean. 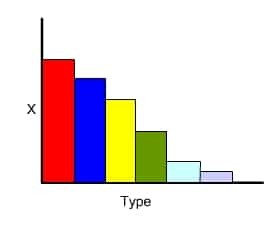 Shape of the histogram: Bell or normal shaped histogram is expected. Other than normal or bell shape means something wrong with the process responsible for poor quality. As data are not represented in order, the time-dependent or time-related trends in the process may not be revealed. Run Charts are better option over histograms as they overcome the limitations of the histograms. A run chart represents change in measurement over a sequence or time. Run charts are used to determine cyclic events and their average values. Pareto Charts are used to apply the 80/20 rule of Joseph Juran which states that 80% of the problems are the result of 20% of the problems. A Pareto Chart can be used to identify that 20% root causes of problem. A Perot chart is similar like histogram. A flow chart is way of representing a procedure using simple symbols and arrows. A Flow chart shows the activities in a process and the relationships between them. A Flow chart lets a process be understood easily. It also demonstrate the relationships between the elements of the process. Scatter diagram is a statistical chart which shows a trend in a series of data. It demonstrates correlations between values. 6) Cause and Effect Diagrams. A Cause and Effect Diagram shows the relationship between effect and the categories of their causes. The diagram look like a fishbone it is therefore also called fish-bone diagram. Cause and effect diagram enables a team to focus on the content of a problem. It helps to provide a comprehensive picture of the problem and the root causes of the same. Control charts are statistical tool, showing whether a process is in control or not. It is a graphical tool for monitoring the activities of an ongoing process also referred as Shewhart control charts. Heat Transfer Notes , Article , Interview Que. and Ans.